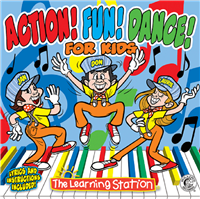 Our selection of preschool music CDs includes fun songs and activities to get kids moving! Teachers love how these CDs for early childhood development bring kids together while teaching valuable skills including math, science, and all about their surround world. It’s important that fun music for preschool classrooms have an element of participation and cooperation in order to inspire kids to work and play together in a healthy way. We have preschool music CDs from the famously fun Jack Hartmann, The Learning Station, and many other favorites kids will love. Playing fun musical games in the classroom is a great way for kids to let out excess energy while expanding their little minds. While these CDs are great for the classroom, they’re just as fun at home! Kids will love dancing to these songs with mom and dad while they learn letters, numbers, and more! Shop around to find your kids’ favorite CDs or give us a call at 1-800-23-CHILD to speak with our team of professionals who can help you find exactly what you need.